In 1959, he won first prize at the International Competition of Orchestra Conductors held in Besançon, France, and was invited the next summer to Tanglewood by Charles Munch, who was a judge at the competition and music director of the Boston Symphony Orchestra at the time. He proceeded to study under Karajan and Bernstein and went on to serve as assistant conductor of the New York Philharmonic, music director of the Chicago Symphony Orchestra's Ravinia Festival, music director of the Toronto Symphony Orchestra, and music director of the San Francisco Symphony. In 1973, he became the 13th music director of the Boston Symphony Orchestra, where his tenure of 29 years was the longest in the history of American orchestras. As music director of BSO, he built the orchestra's reputation nationally as well as internationally, with successful concerts in Europe in 1976 and Japan in March 1978. In March 1981, BSO toured 14 cities in America to commemorate its centennial and then executed a worldwide tour in fall of the same year, with stops in Japan, France, Germany, Austria, and the United Kingdom. It went on to perform in Europe in 1984, 1988, and 1991, and Japan in 1986 and 1989, all to great acclaim. 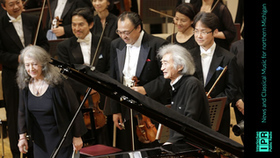 In Japan, Ozawa formed the Saito Kinen Orchestra with Kazuyoshi Akiyama in 1984 to commemorate their late mentor, Hideo Saito. The orchestra held greatly successful concerts in Tokyo and Osaka and went on to tour Europe in 1987, 1989, and 1990. In 1991, it performed concerts in Europe and America and was received with great accolades. These activities lead to the inception of Ozawa's artistic dream in 1992: the Saito Kinen Festival Matsumoto. Ozawa became director of this international music festival, a role that continues to this day. SKO continued to tour, with overseas concerts in 1994, 1997 and 2004. 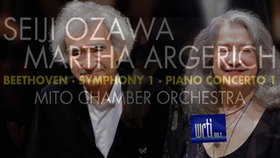 From 2015, the festival has entered a new stage as the "Seiji Ozawa Matsumoto Festival". Ozawa has won many awards in Japan and abroad, including: the Asahi Prize (1985); an Honorary Doctorate from Harvard University (2000); the Austrian Cross of Honour for Science and Art, First Class (2002); the Mainichi Art Award (2003); the Suntory Music Prize (2003); an Honorary Doctorate from the Sorbonne University of France (2004); Honorary Membership from the Wiener Staatsoper (2007); France's Officier de la Légion d'Honneur (2008); Foreign Associated Member in the Académie des Beaux-Arts de l'Institut de France (2008); the Order of Culture, which is the highest honor in Japan (2008); Giglio D'Oro by Premio Galileo 2000 Foundation of Italy (2008); the first Japanese national to be bestowed honorary membership to the Vienna Philharmonic (2010); the Praemium Imperiale from the Japan Art Association (2011); the Akeo Watanabe Foundation Music Award (2011); and the Kennedy Center Honors (2015). 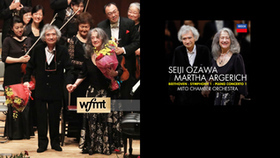 In February 2016, the Ravel L'enfant et les sortilèges album conducted by Seiji Ozawa and performed by the Saito Kinen Orchestra that was recorded at the 2013 Saito Kinen Festival Matsumoto won the 58th Grammy Award for Best Opera Recording. In April 2016, he was named an Honorary Member of the Berliner Philharmoniker. 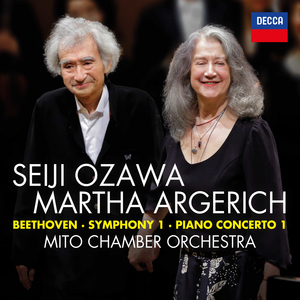 Grammy-winning icons Martha Argerich and Seiji Ozawa record an album for the first time together. Their Decca album features Beethoven's Symphony No. 1 and Piano Concerto No. 1, performed with the Mito Chamber Orchestra.